So I made it through church without a meltdown. I made it through the weekend without a meltdown. I know, I know I am so braggy, right? Oh don't you worry, there WILL be meltdowns this week as we get closer to moving day....Friday. 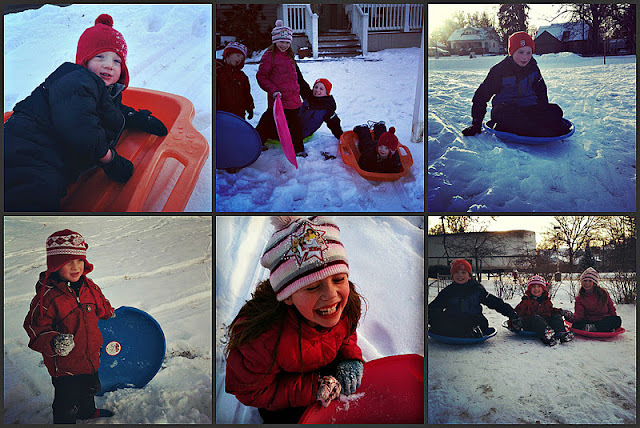 This past weekend was weekend full of Peter Pan and sledding. Not what you thought I was going to say right? Well it was a bit unplanned. Friday night we had planned on going to Movie Night at our kids' school even though Tim wasn't too eager. So, when it started snowing hard he saw his out. "Well, it's snowing, I guess we should stay home," he announced with a little too much enthusiasm. The kids were pissed. After a few tears, the kids decided to watch Peter Pan. Not the crappy Disney version, which I have shared my dislike of before. But it turns out this version (circa 2003) was really good. The fight scenes were good. The humor was funny. And it had Coldplay songs. Awesome. It really captured that whole magic of childhood thing. Of course I cried at the end. Saturday I had to prep for a class I was teaching in church the next day. It just so happened to be about finding the magic in childhood. I couldn't get Peter Pan out of my head. So, Tim and I rented (yup we rented a movie at Blockbuster, which I didn't even think was still in business, but it is) the movie Finding Neverland. Because I wanted to cry a little more and it is just more Peter Pan awesomeness. While outlining another cool agenda (like last week's class), I was wrapping myself in the whole idea of imagination and mindful parenting. I let the boys play a little too many video games while I was preparing to tell my fellow parents how to er, um, parent. When I realized, damn, it had been too long, those boy should stop playing, I told them they had to "turn off those video games now!" Again, the kids were pissed. But they also weren't stopping. They kept playing. "Let me finish this level." "One more minute." Irritated, but not furious, I turned off the tv. Well I might as well have told them there was no Santa, we would never eat chocolate again, and worst of all the ipad was broken and we weren't fixing it, ever. They stomped around. JT, the five-year-old, cried and went to his room. Peyton, the 10-year-old, muttered something. "What did you say?" I asked. Busted, he looked down. "What did you SAY?" I repeated. After a few minutes of repeating my question in various tones, Peyton said "I said I hate her. That's what I said." Ouch. It's so different to have your 4 or 5-year-old say "I hate you" than your pre-tween say it. It stung. But then I just thought how stupid it was that he hated me over video games. I felt like telling him, "Dude, save it. There will be so many more reasons to hate me." Like when I tell him he can't go to that cool kid's party because his parents aren't home. Or when he finally figures out that if he gets a car when he's 16 it will be so he can help us pick up his younger sister and brothers and drive them around. So many reasons. He has no idea how much he is going to hate me. So as I prepare for the onslaught of hate, I know I have to toughen up. But I also know that I have to enjoy the magic of the moments now. And as I think about all the lessons this Peter Pan-filled weekend has taught me I realize a few things. Like the fact that yes, most of the time I have to be all about rules and limits, but I can also understand and empathize with why my kids don't get it. And that's okay. It's nothing personal. And I can have a little fun too. Because it's all a little magical and it's going fast. Some themes discussed last week that are still brilliant. necessary to come to full adulthood. Today we will discuss who you were, who you are and focusing on the magic in the First Mile....for you and your kids. 1. A Senior Moment-You’re not a freshman parent anymore. -Do you ever find yourself wishing time away? 2. What the hell is the first mile? According to Corrigan, the average person knows less than ten stories from their childhood. Does this statistic seem accurate? What does our early childhood mean if we can’t remember it? Would you like to share any pivotal or meaningful memory from your childhood? Corrigan describes our self-sabotaging ways empathetically: People rarely rave about their childhoods and it’s no wonder. So many mistakes are made. I see how that happens now, how we all create future work for our kids by checking our cell phones while you are mid-story or sticking you in the basement to watch a movie because we love you but we don’t really want to be with you anymore that day, or coming unhinged over all manner of spilt milk--wet towels, unflushed toilets, lost brand-new! whatevers. Feel like sharing any shortcomings? Again we won’t judge you, we will either nod in agreement or silently feel a lot better about ourselves. on my blog last fall. -And your six words are????? Corrigan says parenthood is a “bold and dangerous” endeavor. Would you agree? Peter Pan isn’t such a @#&%. version had some great action scenes. Very good indeed. don’t know it, you need to. Time for an amazing movie clip. How do you find the magic in your kids? In parenting? Go forth and parent. Find the magic. And if you screw up, begin again.